At 3:44 a.m. EDT a SpaceX Falcon 9 rocket with the Dragon spacecraft successfully lifted off from the Cape Canaveral Air Force Space Station launch complex 40 for its maiden voyage to the International Space Station on its second demonstration flight as part of the NASA Commercial Orbital Transportation Services program. Indeed, as not only was the commercial space sector looking at SpaceX for success, but SpaceX’s future is very much dependant on the success of this and upcoming launches. While SpaceX customers have been very supportive and while the company is now almost 10 years old, SpaceX is very much the new kid on the block with a lot to prove. Today’s successful launch will go a long way for its credibility. This is the third launch attempt for the Falcon 9 and all have successfully reached orbit. However while the launch was successful there are still many milestones ahead of SpaceX on this mission. During the mission, Dragon must perform a series of complex tasks, each presenting significant technical challenges. – Day 1/Launch Day: SpaceX’s Falcon 9 rocket launches a Dragon spacecraft into orbit from the Cape Canaveral Air Force Station. – Day 2: Dragon orbits Earth as it travels toward the International Space Station. – Day 3: Dragon’s sensors and flight systems are subject to a series of complicated tests to determine if the vehicle is ready to berth with the space station; these tests include maneuvers and systems checks that see the vehicle come within 1.5 miles of the station. – Day 4: NASA decides if Dragon is allowed to attempt to berth with the station. 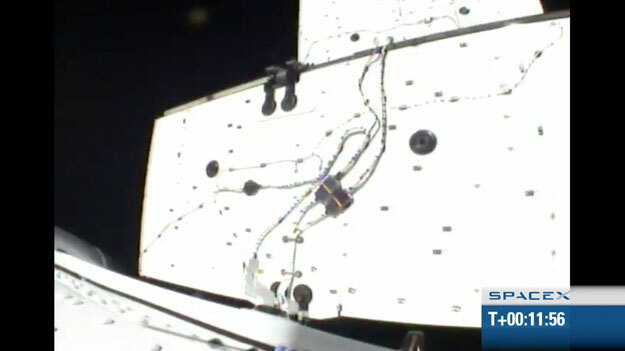 If so, Dragon approaches; it is captured by station’s robotic arm and attached to the station. This requires extreme precision even as both Dragon and station orbit the earth every 90 minutes. – Day 5 – TBD: Astronauts open Dragon’s hatch, unload supplies and fill Dragon with return cargo. – TBD: After approximately two weeks, Dragon is detached from the station and returns to Earth, landing in the Pacific, hundreds of miles west of Southern California. During the berthing phase the Canadarm will be used to grab the Dragon capsule and position it for berthing with the ISS. Should the rest of the mission go as well as the launch, SpaceX will done much to prove the case of the sometimes maligned new commercial space companies.